US navigation systems manufacturer Trimble has announced the release of the SPS356 DGNSS beacon receiver, a positioning system specifically designed for marine construction projects requiring a high degree of positional accuracy. Trimble SPS356 DGNSS beacon receiver. Aimed at marine applications such as dredging and bathymetric surveying, the SPS356 boasts Global Navigation Satellite System (GNSS) positioning capabilities accurate to under one metre, Trimble says. The unit can be configured to receive positioning information from a variety of satellite constellations including the US Global Positioning System (GPS), the Russian GLONASS or the Chinese BeiDou systems, as well as local satellite-based augmentation systems. Accuracy is further enhanced by corrections sent to the receiver by any local MSK beacons. The SPS356 has a range of connection capabilities including Wi-Fi, Ethernet and Bluetooth. Using Wi-Fi, the SPS356 can be accessed via any device with a web browser, including smart phones, tablets and laptops. Trimble says the SPS356 comes in a rugged housing designed to resist the harsh conditions sometimes experienced at sea. The housing has high shock and vibration ratings and can be installed aboard any marine vessel. The unit has an optional internal battery, which allows the SPS356 to continue operating through power outages, surges or interruptions, all of which are common occurrences in marine applications. 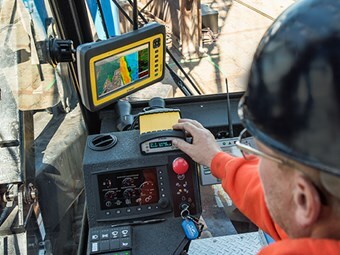 The receiver is part of Trimble’s wider Connected Site strategy, a series of positioning and communication options designed to work together seamlessly to provide instant updates to operators in the field and to those back at head office. This reduces downtime and keeps projects on track as users on both ends can adjust to updates in real-time.